I started a new writing class today. The take away assignment was to write a page or two, doubled spaced, about a childhood memory about reading. I rode the city bus to campus to avoid parking horrors, and on the ride home, I opened my writer's notebook to catalog the memories flooding into my mind. As I sorted them, I decided to write about the Book Mobile so that I could reach my assignment goal of two pages. But as the day has progressed, I keep coming back to my mother reading me The Secret Garden at bedtime. The cover to the left is the one of my childhood. At first I did not like Mary at all. She was rude. She was sour. She was unfriendly. I had nothing in common with her, but envied her adventure to a new land. My mother kept reading and as the story unfolded, I finally found a connection to Mary. She asked for a bit of ground. My grandmother regularly set me outside with a spoon and a bowl in the dirt for a morning's occupation. We both grew in the dirt. We both learned about ourselves in the dirt. We found ourselves in the garden. It is a wonderful tale. And it is not just for girls! Dickon and Colin are beautifully developed boy characters. As a matter of fact, Dickon, a boy who could "talk" with the animals, is one of my son's first and favorite friends from literature. To help with the temptation we have to judge a book by its cover, puffin classics has a new addition with updated art. There are also many additions that only have our friend the robin on the cover, if you are trying to get a boy interested. So, the movie came out the weekend. We have bought it and watched it. My son has actually watched it twice. I was struck by the details of the novel that were left out and by the art direction of the movie. District 12 looked just as I imagined, but the Capital was so much more. All I could think of, as I watched, was how much the Capital reminded me of the Emerald City. And the all powerful Oz, or in this case President Snow, acting as the puppet master. Watching the movie has made me add the Hunger Games back to my "to read" list. I am always up for a reread. And with this book and the attention given it by young readers, I feel I should know my stuff. It has also piqued my interest in rereading The Wonderful Wizard of Oz by L. Frank Baum. 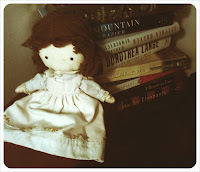 A few words on rereading... It is one of my favorite occupations. I tend to give over to my need to know how the story ends and rush through on my first attempt. When I pick up a novel to reread, I find little jewels left by the author. Those brief allusions that make me feel like a member of an exclusive club or some sub-theme that makes me see the text in an entirely new way. If this is not already a part of your reading practice, you might want to give it a try. My first attempts at convincing my son of this practice were met with "But Mom, there are so many books and so little time." This is true, but a great book is always waiting to tell you just a little bit more. I just finished up registration for book club with the help of our Media Specialist, Mrs. Greer, and we have 162 students between 3rd and 8th grades participating. This is out of about 750 students, so I am very excited, if not just a bit overwhelmed. The registration forms include a ballot. There is also a place for children to write in their suggestions for the group. One of my most voracious readers in the 8th grade suggested this new novel by Ransom Riggs. 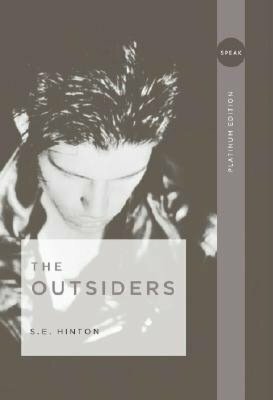 I have just read it myself, but didn't include it with my suggestions, because as a rule I don't include a book unless is it available in paperback. This summary is accurate, but the thrill and adventure is not what I loved about the book. I am a sucker for rich characters, and this book is filled with them. I felt like I was reading a diary, and I came to care deeply for not only Jacob, the main character, but all of the other people, both peculiar and not, who help shape him into the man he is becoming. 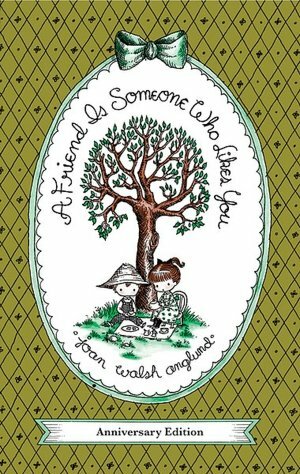 Upon completing the novel, I was also reminded that the people we love can always surprise us, and sometimes for the better. Bird rescue update. Lou is thriving. His feathers are filling in nicely. He is eating seeds and trying his wings out with a short flight or two. This evening, I headed out to our screened in porch and found him and my son studying for a history test together. Lou was perched on Miller's shoulder and nestled up beside Miller's ear. As Miller's back began to tire of the slanted posture he had assumed to make Lou the most comfortable, he placed Lou onto the table with its stacks of notes and Lou immediately pooped. The love between Miller and Lou reminds me of Sam Beaver and Louis, in E. B. White's, The Trumpet of the Swan. If we would permit it, I am sure Miller would hike Lou onto his shoulder and proudly take him to school, just as Sam did. I am not sure if our Lou has the intelligence or size to master writing on a chalk board like Louis, but the bond between bird and boy is growing just the same. When Lou finally flies away from our home, it will be fun to imagine the adventures he is up to and wonder if he, too, is finding a mate and starting a family. If you have not given this novel a try it is well worth the time. 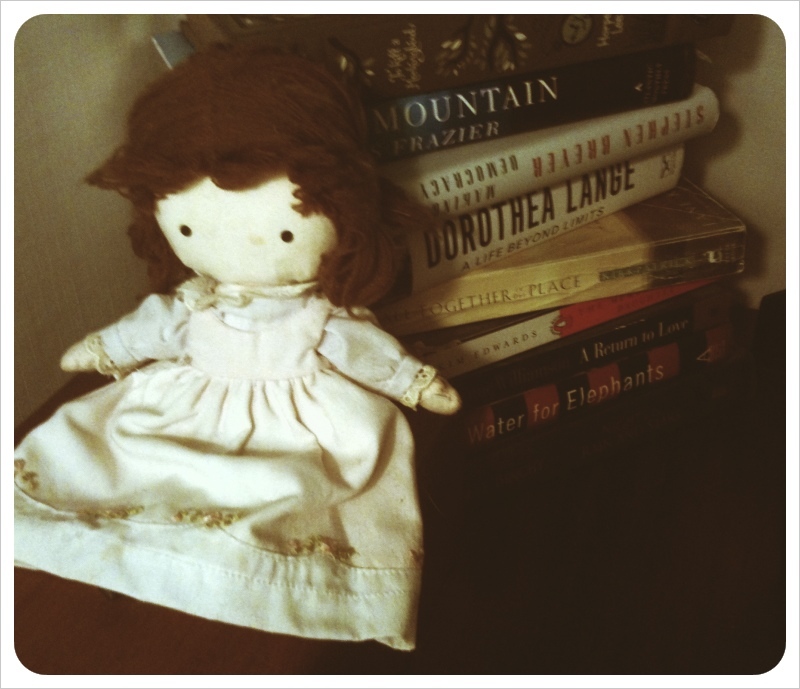 John Updike was quoted in the New York times as saying, "While not quite so sprightly as Stuart Little, and less rich in personalities and incident than Charlotte's Web, The Trumpet of the Swan has superior qualities of its own; it is the most spacious and serene of the three, the one most imbued with the author's sense of the precious instinctual heritage represented by wild nature." As a mother, I am a big fan of Louis' father, who risked life and wing to acquire a trumpet for his mute son. He believed he needed to give his son a voice of his own so he could make his way in the world. I can only hope to do the same for my son. Today was the first day for book club registration at the school my son attends. I went to all of the classes, 3rd-8th grades, presented the forms and explained to every student how to join our group. This year the children will pick books for themselves. To prime the selection process, I put a few titles on each ballot and invited write-ins. 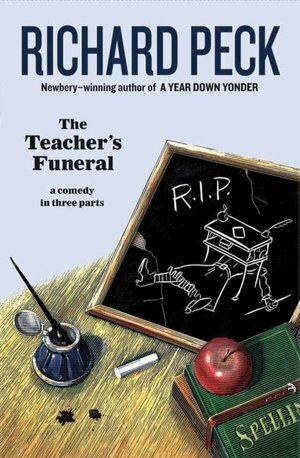 On the fourth grade book list I included this wonderfully funny book by Richard Peck, The Teacher's Funeral. It has one of the most appealing first lines in a novel for a student, if you find yourself in a school classroom for most of your young days- "If your teacher has to die, August isn't a bad time of year for it." This book, is full of wit and sass. Russell Culver is fifteen in 1904, and he's raring to leave his tiny Indiana farm town for the endless sky of the Dakotas. To him, school has been nothing but a chain holding him back from his dreams. Maybe now that his teacher has passed on, they'll shut the school down entirely and leave him free to roam. I imagine during these August days, when the temperatures are so high that our students must have indoor recess, many a student awakens from a daydream of their own. And while their dreams might immediately seem wildly different, after reading this book, you will be reminded that the theme of youth's interests in taking on the world is still very much alive in this new century of ours. Today was coffeehouse for the 6th grade writers at my son's school. They are reading their first compositions of the year. The type of work required for the day was personal narrative. As I listened to these writers reading their creations, I was impressed by their ability "to show not tell" the story. The language was delightful They are learning to take risks with new words and it is definitely improving the work. It brought to mind this lovely little dictionary. 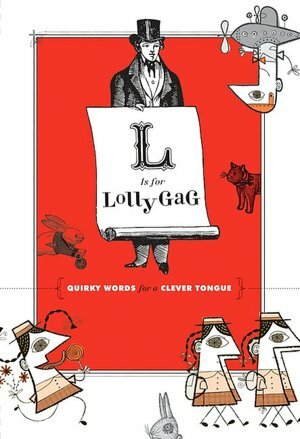 It claims to be a book of "quirky words for a clever tongue," and it delivers. It defines words like agog,eager or really excited, and hanker,to yearn or have a real longing for something, while giving interesting facts about words along the way. Did you know, for instance, that a pangram is a sentence that uses every letter of the alphabet? And, that the most famous pangram is, "The quick brown fox jumps over the lazy dog." Or that there are authors who purposely refrain from using certain letters or words. This is referred to as a lipogram. Can you think of a oxymoron to share with us? If not, you should give this book a try. Send the best one along. Miraculously, it was raining this morning and only 80 degrees as I headed out for a lunch meeting. This meant that I could use one of my favorite accessories-my umberella. My brolly, as it is sometimes called in Great Britian, is exactly like Mary Poppins', except that my parrot doesn't talk, yet! I bought it at a production of the play in New York. It is a treasure to me. As I was toting it to the car, I thought back to the Olympic Opening ceremony and the section honoring children's literature. The best moment for me was when the flock of Mary Poppins's came floating in to put the children to bed. 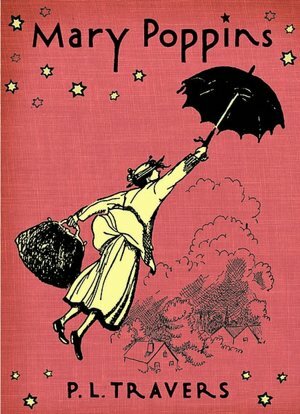 Mary Poppins, written in 1934, is a part of a series written until 1988. The series continued when Mary Shepard, the illustrator, became the second author. The novels are darker than the Disney film, however the current Broadway production is truer to the text. They are each magical tales and deserve your attention. If the language is difficult for your young reader to master, try it as a read-a-loud.